Dance fly feeding on a white rhododendron flower. In mating swarms, males fly up and down in a sort of dance. They have captured an insect, wrapped it in silk, and hold as an offering for females. Females seem to choose the male with the most enticing offering. Sometimes a male may offer just an empty ball of silk. There’s definitely an unwritten story there. As in what does the female do when she finds out the silk is empty? What kind of female prefers the empty ball of silk? Is this Empid silk or are they outsourcing to Saturniids? Intertubez folks, you have a great weekend, here or there. 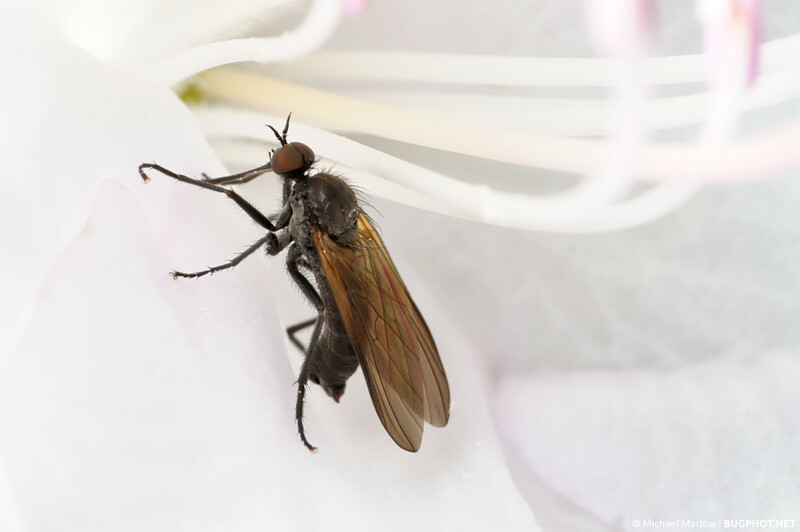 Posted in DipteraTagged dance fly, Empididae, Macro Photography, rhododendron, whiteBookmark the permalink. Romance like this is inspiring. I’m going to go kill something for my wife now. Crap. I wasn’t inspired enough to actually get off the couch.